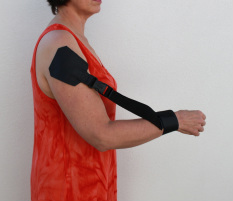 The brace limits full straightening of the elbow. Once the median and radial nerves are sensitised, simple day to day reaching movements and activities may aggravate pain arising from these nerves. These movements are very difficult to avoid and despite the pain aggravation are frequently inadvertently performed each day. Through limiting full elbow straightening (extension) the brace prevents painful longitudinal loading and the aggravating movements are prevented; allowing the painful movements a degree of relative 'rest'. The pictures below demonstrate the changes in load on the nerve with the arm straight compared to when the elbow is bent. The consequences of avoiding the full longitudinal loading of the nerve are discussed in the page entitled Rationale for the benefits of the brace. Use of the brace reduces fear of movement. 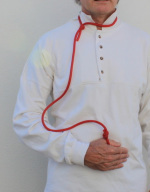 Due to the ease of symptom aggravation and the severity of aggravation, people may become very fearful of moving the arm and the brain may initiate excessive defensive pain reactions; further adding to the ease of aggravation. 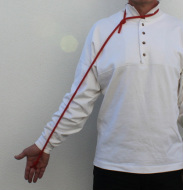 Use of the brace limits unintended aggravating movements; it allows movement within a 'safe', non-provocative zone. The arm may be moved without fear of provoking a sustained symptom reaction.